Here’s the script accompanied by a lot of bombast, signifying not much. 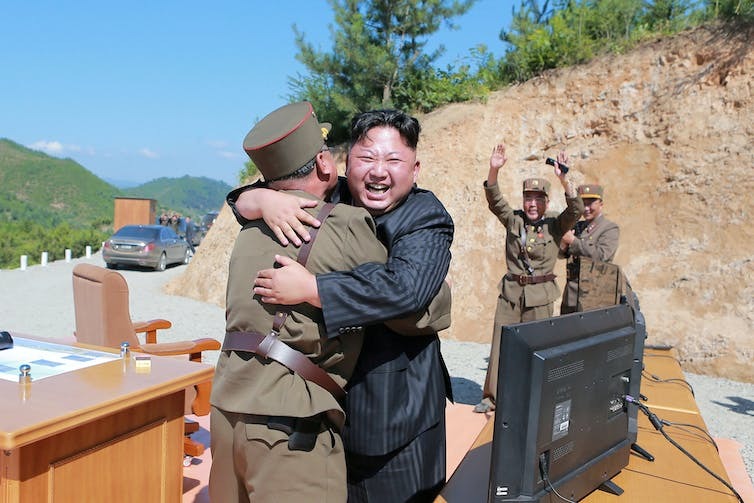 North Korea launches another missile – its 18th for the year and 80th since Kim Jong-un assumed power in 2011. This time it travels over Japan itself. The “international community” expresses outrage. Australia echoes these imprecations – at a distance. Meanwhile, US-South Korean war games proceed, according to schedule, on the Korean peninsula. North Korea ignores the threats, and prepares for its next missile launch. Clearly, a “fire and fury” strategy is not working. The question then becomes: what are the alternatives? Back in July, the Council on Foreign Relations provided a useful primer. In that post, the author referred to a proposal by Chinese delegates to a US–China Diplomatic and Security Dialogue in Washington in June in which they advanced a two-step strategy based on previous remarks by China’s foreign minister, Wang Yi. First, the US would suspend US-South Korean military exercises (the twice-yearly ones now in progress) in exchange for a freeze on North Korean missile development and testing. Second, China would monitor North Korean compliance. Should North Korea infringe on such an agreement China would withhold economic benefits and security assurances. In other words, China would have skin in the game – and perhaps, more to the point, risk losing diplomatic face if such a process faltered. The above approach is not dissimilar from the one the Obama administration adopted in negotiations with Iran over a freeze on its nuclear program. There was no single “big brother” standing in the wings to exert pressure on Iran. However, the involvement of the five permanent members of the United Nations Security Council plus Germany contributed to a satisfactory – far from perfect – outcome. Under the Joint Comprehensive Plan of Action, Iran agreed to freeze its enrichment program and subject itself to stringent International Atomic Energy Agency inspections. Unfortunately, the Trump administration has belittled the plan to such an extent that this makes it more difficult to arrive at a similar solution to the North Korean crisis. Donald Trump himself has described the Iran agreement as the “the dumbest deal … in the history of deal-making”. This criticism is echoed by administration officials, including Secretary of State Rex Tillerson – although the US continues to certify Iran’s compliance each 90 days. Such is the febrile nature of American diplomacy these days. As things stand, no amount of huffing and puffing by the Trump administration or its allies seems to have much effect on North Korea. The rogue state appears intent on engaging in a game of brinkmanship on an almost-weekly basis, thumbing its nose at round after round of UN sanctions and other measures designed to curb its nuclear and ballistic missile ambitions. China has backed the latest round of sanctions and applied some of its own, but it is caught between its perceived obligations as a responsible international stakeholder and its more immediate concerns about stability on the Korean peninsula. China displays legitimate anxiety about a conflict between the two Koreas spiralling out of control, destabilising East Asia in the process and, no doubt, causing a tidal wave of refugees to cross into China itself. From China’s perspective, maintaining relative calm on the Korean peninsula is a number-one priority. This leaves aside other considerations like its usefulness to China of a divided Korea as a buffer against a US-Japanese-South Korean security bloc in East Asia. These are all complex calculations made more so by Kim’s personality. Perhaps even more than his father and grandfather, he appears willing to push the limits of what the rest of the world – including China – might tolerate. The Kim personality contributes to understandable alarm about risks involved in a game of bluff on the Korean peninsula, given the near-certainty of the annihilation of thousands if conflict erupted. There is no more potentially destructive and volatile corner of the world. Among challenges for the international community in its dealings with North Korea is that country’s apparent imperviousness to sanctions – or, at least, its ability to withstand what are now four rounds of UN sanctions resolutions since 2006. The Council on Foreign Relations writer makes the point that unlike oil-dependent Iran – which yielded eventually to international pressures, including sanctions against imports of Iranian crude – North Korea remains adept at exploiting loopholes in a sanctions regime. It lives with its isolation. 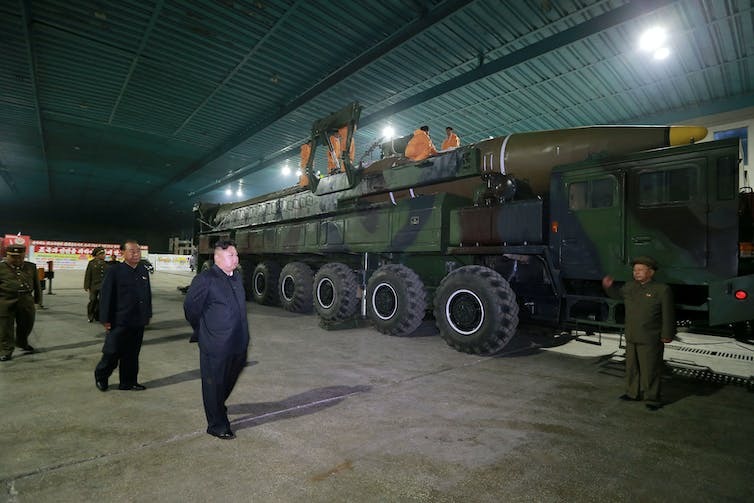 Each new round of missile tests, accompanied by further evidence of North Korea’s nuclear capabilities, should be prompting a searching review of options beyond hyperbolic threats detached from reality. What’s required is a new approach that would draw on experience in dealing with Iran’s nuclear ambitions. China would be a critical component of such a diplomatic offensive whose aim would be to freeze North Korea’s nuclear program and place limits on its missile development. The point is that where North Korea is concerned there are no easy options, simply ones that are less bad. Policymakers in the US and among its allies, including principally Japan and South Korea, should be resisting the temptation to grandstand. The existing approach is not working. A military option does not exist, except in the minds of less rational players. In any solution, China remains the gatekeeper. The US and several of its allies currently deploy several ballistic missile defence systems that would be used in the event North Korea actually launched an attack. North Korea’s test this week of an intercontinental ballistic missile has reignited interest and debate on the feasibility of ballistic missile defence systems, and whether countries such as Australia should seek to acquire them. But what are these systems, and how do they work? How effective would they be in providing a defence against a potential missile attack? All ballistic missile defence systems consist of a network of tracking and guidance radars, and the interceptor launchers. On detecting a ballistic missile launch, the radars track the missile’s trajectory, fire an interceptor to shoot it down, and prepare further interceptors to be launched if the first one misses. This is referred to as a “shoot-look-shoot” strategy, as opposed to a strategy of saturation – where the defender simply shoots as many interceptors as possible in the hope of achieving a kill. Modern defence systems use interceptor missiles carrying kinetic kill vehicles. These are warheads that are non-explosive and designed to destroy incoming ballistic missiles by simply crashing into them. All of the systems mentioned below are intended to work in conjunction with one another. They are integrated to provide the ability to shoot down ballistic missiles throughout their flight path. However, they are also capable of operating independently, although with less effectiveness than if operated in conjunction with other systems. The US and its allies in the Asia-Pacific currently deploy several ballistic missile defence systems. These would be used in the unlikely event that North Korea decided to actually launch a ballistic missile attack. The first and most prominent is Terminal High Altitude Area Defence, or THAAD, which the US has deployed in South Korea. THAAD is designed to shoot down ballistic missiles in the terminal phase of flight – that is, as the ballistic missile is re-entering the atmosphere to strike its target. The second relevant system is Patriot PAC-3, which is designed to provide late terminal phase interception – that is, after the missile has re-entered the atmosphere. It is deployed by US forces operating in the region, as well as Japan. THAAD and Patriot PAC-3 interceptors at work. Perhaps the most capable system currently in operation in the region is the Aegis naval system, which is deployed on US and Japanese destroyers. It is designed to intercept ballistic missiles in the mid-course phase of flight – that is, when the missile is outside of earth’s atmosphere and transiting to its target. The Aegis system in action. What all of these systems have in common is they are theatre ballistic missile defence systems, designed to provide protection against short-, medium- and intermediate-range ballistic missiles. Intercontinental ballistic missiles, such as the one tested by North Korea this week, fly too high and fast for these systems to engage with. Aegis has demonstrated some limited capability to engage targets similar to intercontinental ballistic missiles. It was used to shoot down a malfunctioning spy satellite in 2008, but has never been tested against an actual intercontinental ballistic missile target. The only system expressly designed to shoot down intercontinental ballistic missiles is the US Ground-based Midcourse Defence. However, this has a very patchy record in testing. By the end of 2017 it will only have 44 interceptors deployed. None of these systems is 100% effective, and most have an iffy record in testing. Aegis has succeeded in 35 out of 42 tests, while Ground-based Midcourse Defence has had only ten successes in 18 tests. However, THAAD has been successful in 18 out of 18 tests. Tests are conducted in favourable conditions – and it is reasonable to expect the success rates to be lower in actual combat use. The true difficulty lies with intercontinental ballistic missiles. An intercontinental ballistic missile can attain altitudes well in excess of low earth orbit. Those fired on a typical long-range trajectory can exceed 1,200km in altitude. The high-trajectory, short-range test shot North Korea conducted this week attained an altitude of 2,700km. By way of comparison, the International Space Station orbits at an altitude of around 400km. However, the altitude intercontinental ballistic missiles attain is only part of the problem. The other major challenge facing ballistic missile defence is the truly enormous speeds that missiles attain during the terminal phase. They often hit or exceed 20 times the speed of sound. A common comparison used is that ballistic missile defence is akin to shooting a bullet in flight with another bullet. The reality is even more extreme. For example, a .300 Winchester Magnum (a high-velocity hunting and sniper round) can achieve a velocity of 2,950 feet per second as it leaves the barrel. This equates to 3,237km/h, or 2.62 times the speed of sound. An intercontinental ballistic missile can achieve speeds almost eight times faster than this. As a result, it is almost impossible to reliably defend against such missiles. This is not necessarily a problem for countries such as Japan and South Korea. Any ballistic missile used by North Korea against them would be a shorter-range ballistic missile that these systems could engage. However, countries should be mindful that these systems provide limited-to-no capability to defend against intercontinental ballistic missiles. In Australia’s case, the only missiles capable of reaching this far from North Korea are intercontinental ballistic missiles. Thus, even if Australia decided to invest in ballistic missile defence, it would provide little-to-no protection from a potential North Korean nuclear attack. Military strikes against a Syrian airforce base mark Donald Trump’s first big foreign policy test as president. 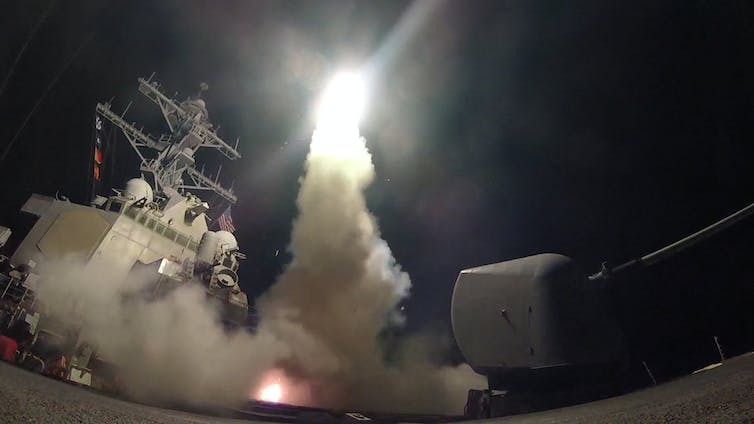 The United States’ unilateral missile strikes against a Syrian airforce base are a dramatic escalation of its participation in that country’s civil war. The US government has attacked a Syrian government asset for the first time. 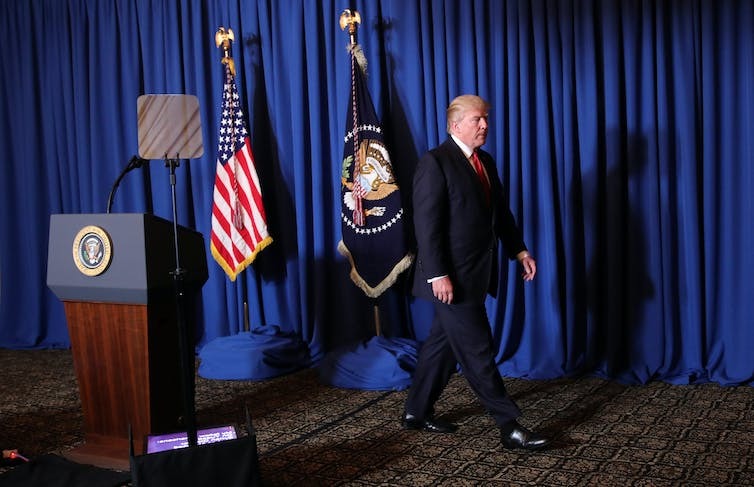 The attack also marks Donald Trump’s first major foreign policy test as US president. It represents a 180-degree shift from his previous position of opposing intervention in Syria. And the sudden about-face sends a worrying signal for how his administration may handle future crises in international relations. On Thursday, the US unilaterally launched strikes against the al-Shayrat airforce base in Homs. This base primarily houses Mig-23 and SU-22 strike craft and Mig-25 interceptors. The attack consisted of 59 sea-launched Tomahawk cruise missiles, which targeted airframes and supporting infrastructure. It reportedly led to casualties among Syrian military personnel. Unlike the actions of his predecessor, Barack Obama, prior to the 2012 Libya intervention, Trump sought no international legal sanction for the strike. The attack has been justified as a punitive response to the Syrian military’s likely use of sarin chemical nerve agents against civilians in Idlib province. This led to at least 70 deaths and drew worldwide condemnation. The Idlib incident was a much smaller repeat of a major sarin deployment in the Damascus suburb of Ghouta in 2013. That attack led to hundreds of civilian deaths – many of them children. The Ghouta atrocity led the US to the brink of war with Syria; the Syrian government was alleged to have crossed Obama’s infamous “red line”. Ultimately, however, diplomatic manoeuvring by senior US, Russian and Syrian officials de-escalated the situation. They were able to negotiate the apparent dismantling of Syria’s chemical weapons program. Recent events, however, suggest this dismantling was not as extensive as previously thought. The strikes were launched from the USS Porter. What’s concerning is how the strikes have been rationalised. Trump has described the strikes as aimed at protecting a “vital national security interest”. However, this appears to contradict one of the fundamental themes that buoyed Trump’s rise to power. Throughout the 2016 presidential campaign, Trump emphasised the need to embrace a transactional approach to foreign relations that placed little value on human rights. The then-presidential candidate was criticised for appearing to be open to accommodating the anti-human-rights predilections of authoritarian rulers provided they served US economic and security interests. Trump condemned the Obama administration’s response to the Ghouta attacks when strikes were under consideration. He explicitly and repeatedly indicated that, as president, he would adopt a non-interventionist position in Syria in spite of the humanitarian crisis. However, the strikes clearly contradict this position. Trump now claims intervention was a matter of “vital national security interest”. Given the Assad regime’s use of chemical weapons threatened no US citizens – nor allies – one is left to conclude that preventing further use of chemical weapons against Syrian civilians is now seen as vital to US national security. This view is itself dubious and inconsistent with a conflict where the US has largely turned a blind eye to half-a-million dead Syrian civilians over the past six years. The US has increasingly contributed to this toll in recent weeks. A point of concern for some has been Trump’s inability to fully grasp the consequences of his actions and his general reflexiveness to the conditions he confronts. As with many of his domestic policy promises on the campaign trail, Trump’s Syria stance appears to be a flip-flop. Shifts in domestic and foreign policy are generally to be expected and afforded some latitude as a candidate transitions to the presidency. But the degree and speed of Trump’s foreign policy switches are of serious concern. Unpredictability in international relations has particularly high stakes. It can lead to rapid escalations, collapse of long-term relationships and partnerships, and even war. This is of particular concern in Syria, given the close proximity of Russian forces actively fighting to defend the Assad regime. The US apparently ultimately alerted (telling, not asking) Russia to the strikes against the Syrian regime. Yet the speed with which such an operation was organised, along with its unilateral and non-consultative nature, does little to dispel the fears of foreign policy realists about the Trump administration’s inconsistent and chaotic approach to world affairs. The US military’s strikes only intensify that debate. Will the system ultimately force Trump to fall in line with a more consistent and predictable approach to foreign relations? Or will the policy bedlam ultimately prove sustainable, and make unpredictability the new norm in the international system? The link below is to an article reporting on the latest in the Syrian conflict, with news that a Russian arms dealer is sending missile systems to Syria.